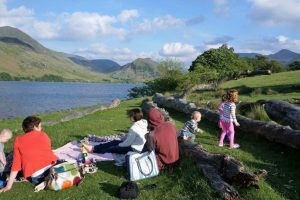 We have had some glorious weather over the past few weeks made even more special by the knowledge that at times we were one of the few places in the country to enjoy it – lots of wonderful walks, picnics, meals outside, even late in the evening. It now scarcely seems to be getting dark at night and the chickens have to be shooed to bed! Looking back over the past month or so, Rannerdale bluebells were very special this year. Although they are on open fellside they are an interesting reminder that there was once ancient woodland there. 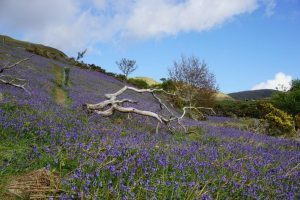 Rannerdale is not the only place locally where there have been stunning displays of bluebells: Holme Wood was super and looking over from the house there was a beautiful blue haze on Brackenthwaite Hows. Obviously the biggest news and celebration of the month was the reopening of the A591 between Keswick and Grasmere: the Lake District had been effectively cut in two by the closure of the road with devastating consequences: it was estimated to cost £1 million a day to the local economy. It is just so good to be able to access beyond Thirlmere again – Lakeland here I come! May is definitely ‘bird time.’ The cuckoos are being very vocal in the local woods. In the garden the wagtails are nesting successfully in the clematis in the courtyard: they are there every year and I do wonder if they are the same ones each time, not sure of the life span of a wagtail. 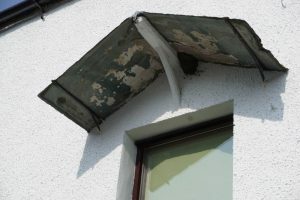 We are also being very lucky with swallows and house martins, there are two nests under the arch into the courtyard, a new one under Crummock porch and the swallows have yet again managed to attach a nest under Buttermere canopy: hope it holds! The Calvert Trust Herdwicks now have lambs and there are lovely activity lamb trails for children! 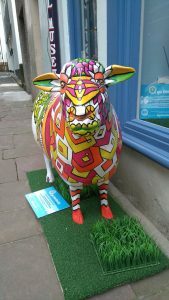 I haven’t managed to see all the Herdwicks yet, I’m still working on it but the opening of the A591 will be a help!